The 12 teams are seeded in three groups of four teams each and will play a round robin within their group including 18 games (three per team). The teams and groups were seeded according to the 2012 IIHF Men’s World Ranking. The tournament includes the top-nine nations and three qualifiers. The 2014 Olympic Winter Games Men’s Ice Hockey Tournament is to operate between 8 and 23 February 2014. The game format will be the same game format used in Vancouver 2010. At the conclusion of the Preliminary Round all 12 teams will be ranked according to a special criterion. This ranking will be used for seeding the teams in the Qualification Playoff games and will used for calculating the Final Ranking at the conclusion of the 2014 Olympic Winter Games Men’s Tournament. The four winning teams of the Qualification Playoff games will advance to the Quarter Final Round. The four losing teams of the Qualification Playoff games will be ranked 9 through 12 according to their ranking after the Preliminary Round. The four winning teams of the Quarter-Final games will advance to the Semi-Finals. The four losing teams of the Quarter Finals will be ranked 5 through 8 according to their ranking after the Preliminary Round. The two winning teams of the Semi-Finals will play for the Gold Medal while the two losing teams of the Semi-Finals will play for the Bronze Medal. The team with the higher Preliminary Round ranking will be the home team in each medal game. The post-Olympic 2014 IIHF World Ranking will be produced after the Olympic men's ice hockey tournament. It is based on the rankings of the four most recent IIHF Ice Hockey World Championships and of the last Olympic men’s ice hockey tournament (including qualification tournaments). Teams are permitted to enter a maximum of 22 players and 3 goalkeepers into the 2014 Olympic Winter Games Men’s Tournament. Game Rosters are set with a maximum of 20 players and 2 goalkeepers per team. The third goalkeeper can be added to a game following the IIHF Bylaws. With the provisional rosters released in January for the 2014 Winter Olympic Games ice hockey tournaments, here is a rundown of the policies regarding player replacement. After the Delegate Registration Meeting, players can only be replaced in case of injuries. In case of injuries, players announced on the provisional roster can be replaced with any player that was named in the 1st October athlete long list. During the respective Directorate Meetings on 7th February (women) and 11th February (men) the final rosters will be confirmed. As per IIHF regulations, the Late Athlete Replacement Policy will be permitted for a limited time following the conclusion of the first Directorate Meeting to ensure that every team is healthy for the start of the tournament. A team with an athlete that was announced at the first Directorate Meeting but who is unable to compete in the tournament due to injury, may replace the athlete using the IOC LAR policy by the following deadlines: Two hours before the start of the Men’s Tournament (21:00 local time on Wednesday 12 February 2014) and two hours before the start of the Women’s Tournament (12:00 local time on Saturday, 8 February 2014) respectively. For the men’s tournament, a maximum of eight athletes (or less, depending on the number of NHL players named to the provisional roster which determines the max number of ‘P’ athletes) can be designated as training partners (‘P’ athletes). These are athletes that weren’t named as part of the provisional roster, but who can travel to Sochi and train with the team, provided they were included on the 1st October athlete long list. The purpose for this is so that teams with players that will not be available to train with the team prior to the start of the Olympics (i.e. NHL players), will still have as close to a full complement of players to train with as possible prior to those players’ arrival. The following table provides a summary of the major differences between the NHL Rules and the IIHF Rules. Face-offs Both players facing-off are prohibited from batting the puck with their hand in an attempt to win the face-off. Any attempt by either center to win the face-off by batting the puck with their hand shall result in a Minor penalty. Any attempt by either player to win the face-off by batting the puck with their hand shall result in stoppage of play and a new face-off will be set up following the replacement of the player that played the puck by the hand and caused the stoppage. Length exceptions 65” (165cm) permitted for the players 6’6” (198cm) tall with the approval of League’s Hockey Operations For the 2014 Olympic Winter Games men’s and women’s tournaments, the IIHF will accept requests for an exception to the length of the shaft of a players stick. This exemption is only applicable for athletes with a height of 2 metres or more. The request for an exemption must be submitted in writing to the IIHF office and must be subsequently approved in writing by the IIHF prior to any such stick being used by the respective athlete. With the exemption, the maximum length of a players’ stick will be increased to 165.10 cm. A minimum ½” knob of tape or protective covering must be at the top of the shaft. The top of the shaft must have a form of protection. Match penalty – Attempted or deliberately in injured his opponent Match penalty - If an injury. No options. The Bolshoy Ice Dome and the Shayba Arena are part of the Ice Hockey Complex, which also includes the Hockey Training Venue. The Bolshoy Ice Dome is one of the most spacious sport venues, built for holding competitions in the most popular sports. At the same time the word «bolshoy» has become and understandable and recognizable term among many countries and nations that associates with Russia, and in particular with the Bolshoi Theatre and with traditions of Russian ballet, figure skating, hockey and other achievements of the largest country in the world. The venue will host most games of the Olympic men's ice hockey tournament as well as the medal games of the Olympic women's ice hockey tournament. It also hosted games of the 2013 IIHF Ice Hockey U18 World Championship. Bolshoy Ice Dome is a competition venue of a permanent type. 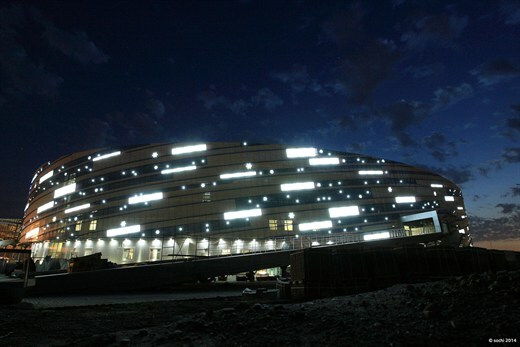 Bolshoy Ice Dome has 7 levels. Three of them are considered as underground levels because of their location under the stylobate area. The venue has two ice sheets, one in the main arena as well as a practice rink. «Shayba» means «puck» in Russian. The name of the venue fully reflects its purpose. Moreover, for Russians the shout «Shaybu!» as encouragement to score a goal is a universal and recognizable way to support their national team on international competitions. The venue will host most games of the Olympic women's ice hockey tournament as well as some games of the Olympic men's ice hockey tournament. It also hosted games of the 2013 IIHF Ice Hockey U18 World Championship. Shayba Arena is a competition venue of a dismountable type. Shayba Arena consists of 4 levels (1 undeground level and 3 overground). The venue has one ice sheet. Two additional ice sheets are available in the nearby Hockey Training Venue. 1936 Great Britain Canada USA Garmisch-Partenk. ¹ The 1920 Olympic ice hockey tournament was a part of the summer Olympics in Antwerp. More historical information is available in our 506-page 2014 IIHF Guide & Record Book which can be ordered as hardcopy or as a handy DVD here. Austria is qualified for the 2014 Olympic Winter Games. Latvia is qualified for the 2014 Olympic Winter Games. Slovenia is qualified for the 2014 Olympic Winter Games. The Netherlands advance to the Final Olympic Qualification. Ukraine advances to the Final Olympic Qualification. Great Britain advances to the Final Olympic Qualification. Croatia advances to the Olympic Pre-Qualification. The 2014 IIHF Men's World Ranking includes the IIHF Ice Hockey World Championships played between 2010 and 2013 as well as the 2014 Olympics. It has been published with the end of the 2014 Olympic men's ice hockey tournament. A second edition of the World Ranking this season will be published after the 2014 IIHF Ice Hockey World Championship. Join us on a tour through the Olympic Park in Sochi 2014's Coastal Cluster.